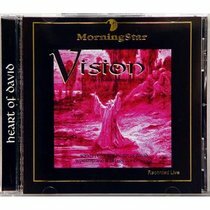 Vision is the final CD in the four CD set of Worship and Warfare I, this CD is also lead by prophetic psalmist Don Potter. This CD follows the theme of Vision, and is also very declarative in Worship and Warfare. Many of the tracks on this CD are very long, but take a more prophetic and spontaneous flavour. Songs like 'Lift your vision higher' which is a call to have a higher vision both of where we are personally and of the things around us both spiritually and naturally. 'I have overcome' which really declares the power of God in our lives to overcome the world, this track flows into the most awesome instrumental and spontaneous flow, Gary Lunn on bass, Mike Maple on drums and Charles Barnett on bongos just go off in the spirit. The CD finishes with the track 'Take the land' which is Gods inheritance for all believers. This is another of a set of four CD's from Worship and Warfare I, MorningStar also recorded a four CD set at Worship and Warfare II, and you can hear the growth of the worship, music, intimacy and freedom that is distinctly MorningStar. This is one of many MorningStar classics and showcases original song writing and worshipers such as Leonard Jones, Suzy Wills, Kevin Proch, Don Potter, and many others. If you are looking for something different and original with a prophetic edge then this CD is one of many.